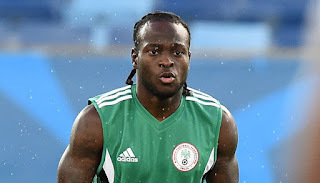 Nigeria striker Victor Moses has pulled out of the Super Eagles friendlies against Mali and Luxembourg later this month. Moses was among the 26 players invited for the game but he won’t be available for selection for the upcoming games. Media Officer of the Super Eagles Toyin Ibitoye said that Moses will be unavailable due to fitness issues. The player who played on loan at West Ham from Chelsea this season has had a tumultuous 2015/16 season owing to injuries and the former Wigan FC man will use the off-season to get back to full fitness. “Yes, he (Moses) has pulled out owing to fitness issues,” Ibitoye confirmed. “No replacement will be called up to replace Moses for the matches against Mali and Luxembourg.”he added. Ibitoye also revealed that FK Haugesund defender William Troost-Ekong will miss the game against Mali but will be available for the second game against Luxembourg. The Super Eagles will now be without team captain Mikel Obi and his assistant Mikel Obi who have been released for Joseph Yobo’s testimonial game. CSKA Moscow striker Aaron Samuel will also miss the test games against Mali and Luxembourg.